The Woodland Park Zoo offered members a sneak preview of its new Bamboo Forest Reserve exhibit, home to two new Asian small-clawed otters. Membership card in hand, excited to receive a free sticker with the other kids, I was there. The exhibit looked great, but all I saw of the new otters was a couple of dark, motionless mounds in their cave, while their pool stood empty but inviting. No matter. On this cold but sunny afternoon, I was eager to put some color on the page, so I wandered over to one of the zoo’s most colorful spots: the Chilean flamingo exhibit. 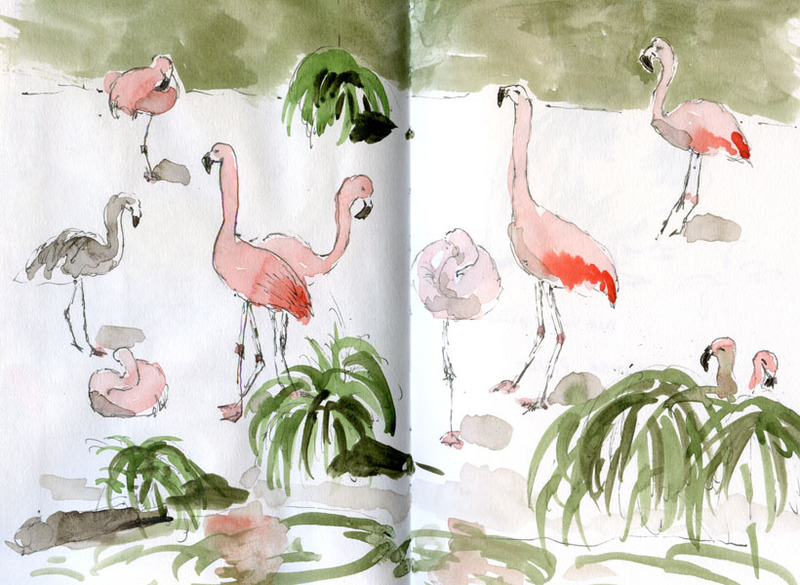 I’ve ﻿﻿﻿﻿﻿﻿﻿﻿﻿﻿sketched the flamingoes several times before, including last July and just about a year ago in April, but I never tire of their bright pink plumage and elegantly long necks. 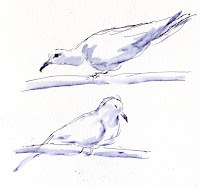 Today a couple of young ones were napping, distinctive with their grayish-brown feathers. 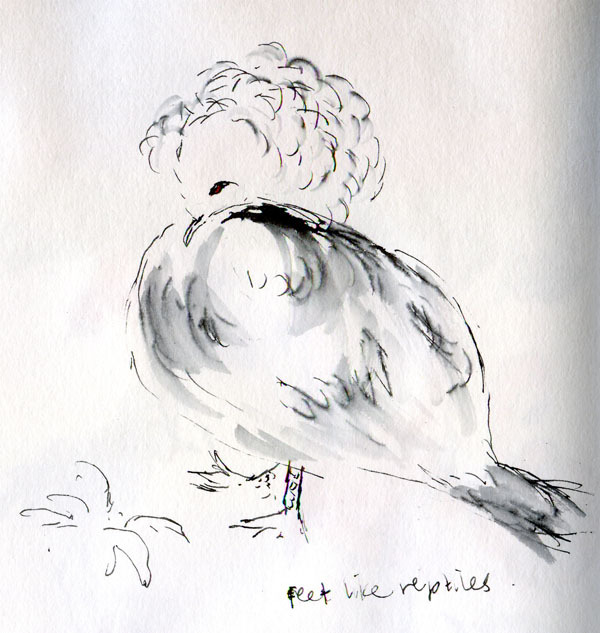 On my way out I walked through the Conservation Aviary, where I did a quick sketch of a Victoria crowned pigeon and its fantastic headdress. 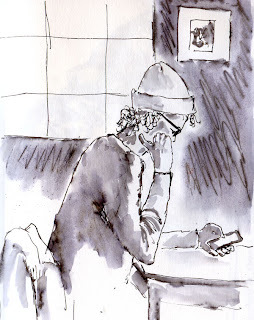 This sketch is the reason I carry a small sketchbook and pen with me wherever I go, even on my regular fitness walks: You never know when a sketch will find you. 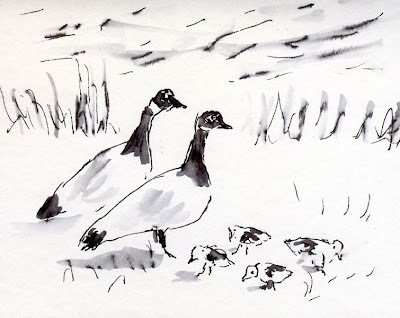 For the three decades or so that I have been walking around Green Lake regularly, I’ve looked forward each spring to the short period when ducklings and especially goslings start appearing close to shore, their respective parents looking around guardedly. All too quickly, those adorable goslings turn into gangly, awkward adolescents. Even more quickly they join their over-populated ranks of adult Canada geese and become poop machines leaving profuse piles in parks and everywhere else they hang out. Most people find geese a nuisance. In theory, I guess I should too, but who can resist those fuzzy goslings? Usually I take mediocre-to-bad photos of the first gaggle of the season, and later I look at those photos on my phone, disappointed. 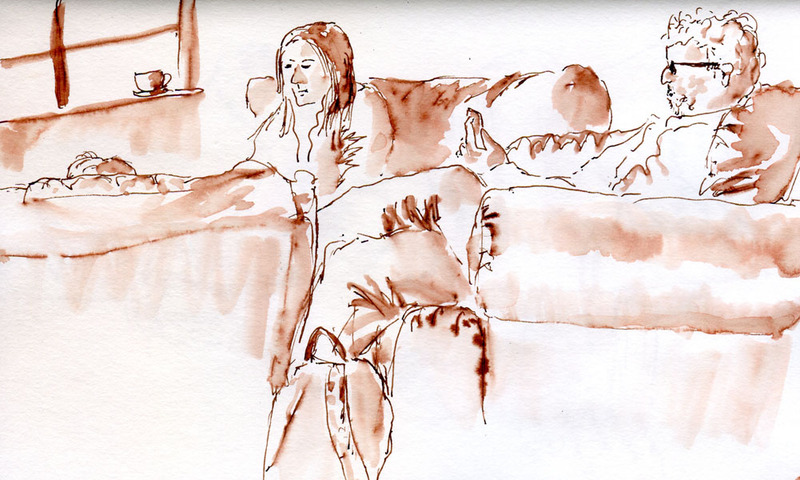 This year I didn’t bother – this five-minute sketch was way more fun and more satisfying. Twenty-five lucky Urban Sketchers met in Mt. 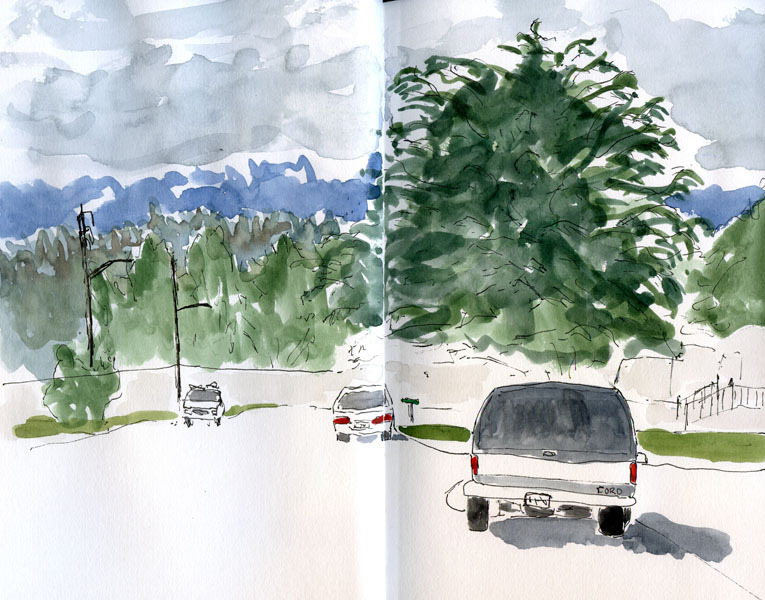 Vernon yesterday for Frank Ching and Gail Wong’s drawing and watercolor workshop, “Line to Color.” The morning was a crash course in composition and perspective from Frank. 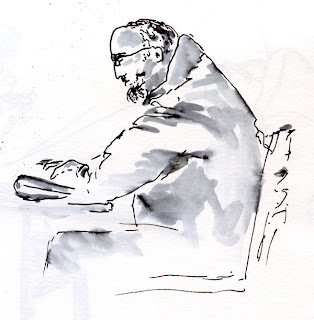 His motto: “Look more, draw less,” which means that he recommends spending a large part of one’s sketching time identifying an interesting composition before ever putting pen to page. He believes that a good composition, which is 80 percent of the success of a sketch, can make up for a less-than-perfect drawing and still result in a great sketch. But a good drawing can’t become a great sketch if it’s placed in a mediocre composition. 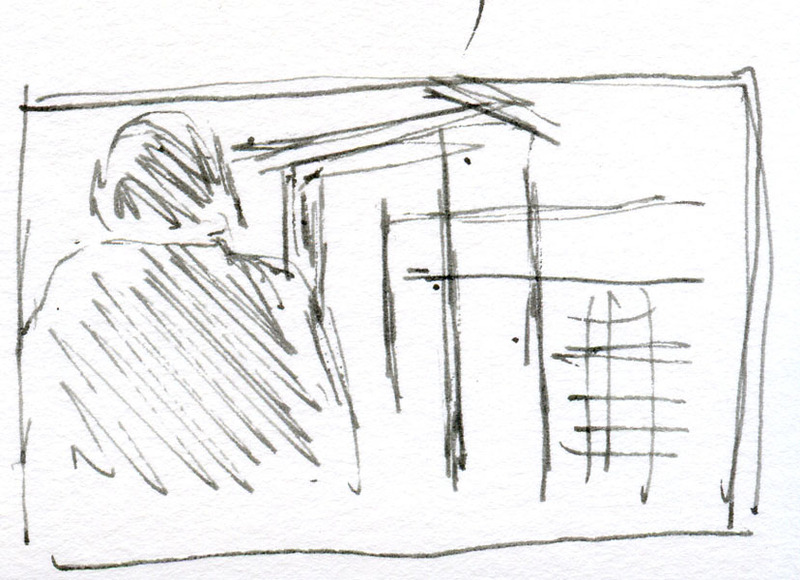 An interesting process step he takes is to sketch out the entire bare skeleton of the composition first very quickly. Then you can add more and more detail to small areas as time permits. “White space is your friend,” Frank said, urging us not to be afraid to leave areas on the page blank. 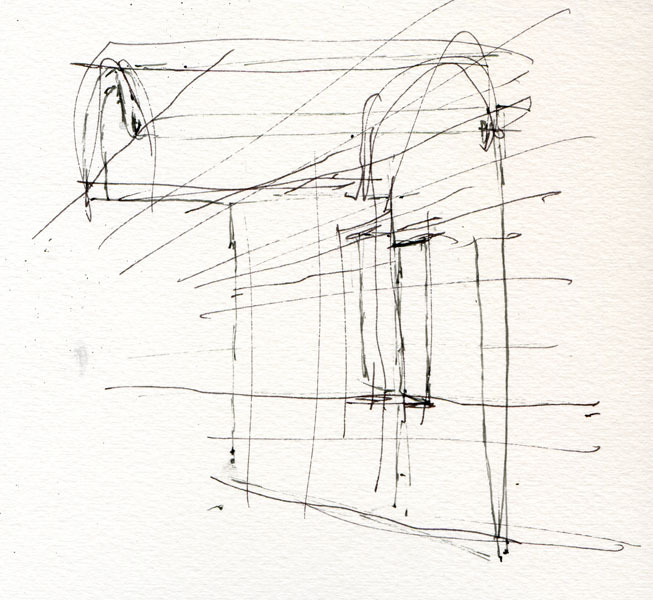 He also encouraged fully drawing out any guidelines that help develop the structure or perspective – in ink. If a line turns out to be wrong, simply redraw it. 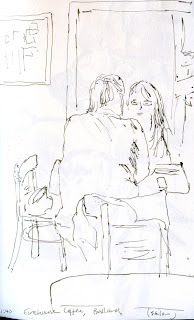 Even incorrect lines add to the life and vibrancy of a sketch. butter, but delish!) 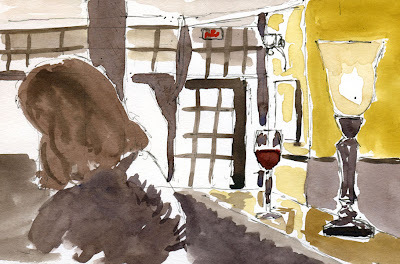 at the Trumpeter Public House, which is adjacent to the Front Gallery that hosted the workshop, the workshop was turned over to Gail for another crash course, this time in watercolor. The most valuable part of the workshop’s watercolor portion was seeing how Gail emphasizes a sketch’s “story” or focal point by painting selectively. Avoid the temptation to paint everything you’ve drawn, she urged. Selective painting is one of the things I admire most about Gail’s sketches, so it was very useful to hear her describe her technique and see examples. 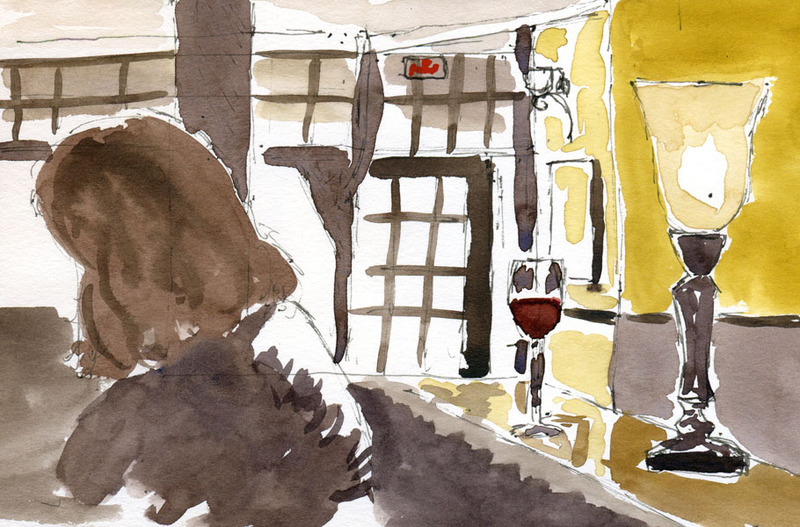 In the same way that Frank uses a drawing’s detailed areas to sharpen the focal point and strengthen the composition, Gail uses color to draw the eye. 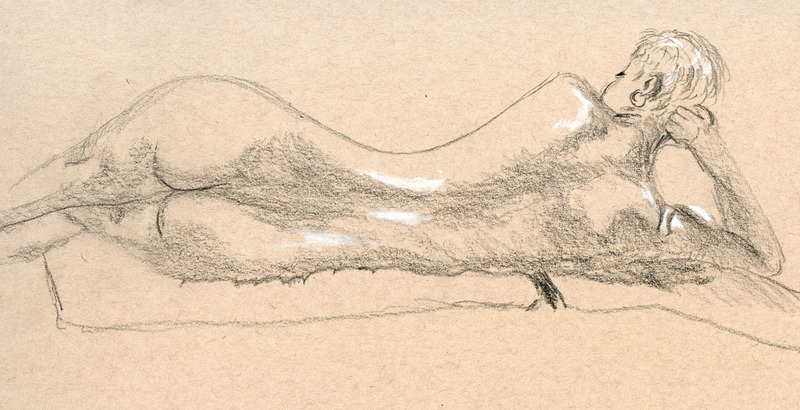 And like Frank, she uses white space as a counterpoint to a sketch’s positive shapes. Gail’s palette favors transparent pigments to those with more opacity. 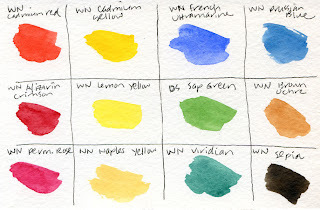 Her suggested watercolor list included the Valazquez palette of Quinacridone Gold, Quinacridone Sienna and Ultramarine Blue, plus Aureolin Yellow, Quinacridone Rose, Pthalo Blue, Cobalt Teal and Indigo. She talked about developing a range of color values from the white of the unpainted page to dark by thinking of the metaphors “tea,” “coffee,” “milk” and “cream”: Start with the lightest value and layer each successively darker value over the previous one. 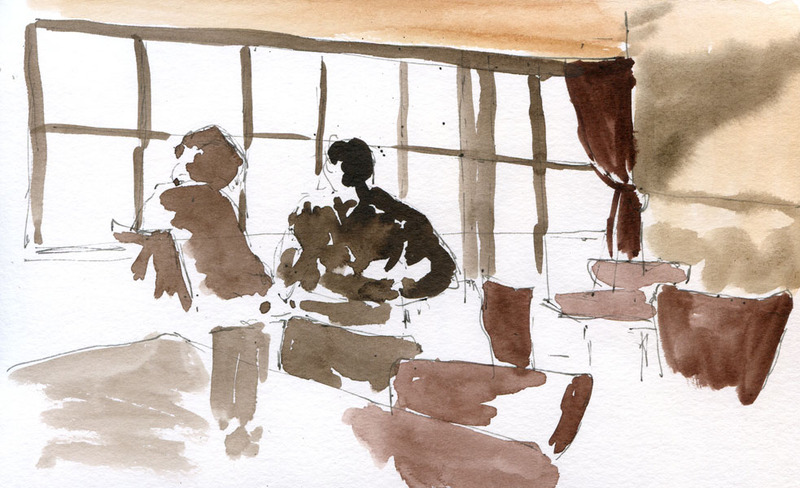 Rain in the afternoon and a chilly breeze all day were less than ideal conditions, but the bar and restaurant at the Trumpeter Public House provided comfortable shelter for indoor urban sketching. For me, yesterday’s workshop was just an intro. I’m going back for more next month when Gail and Frank present an extended weekend version of the same workshop in Seattle! 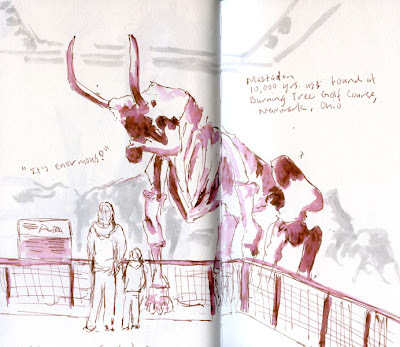 The 38th annual Seattle Cherry Blossom and Japanese Cultural Festival in the Seattle Center’s Armory was supposed to be the purpose of this morning’s ad hoc Urban Sketchers gathering. But the day turned out warm and sunny enough that it seemed a shame to stay indoors, so I spent most of the morning sketching some of the Center’s many attractions. 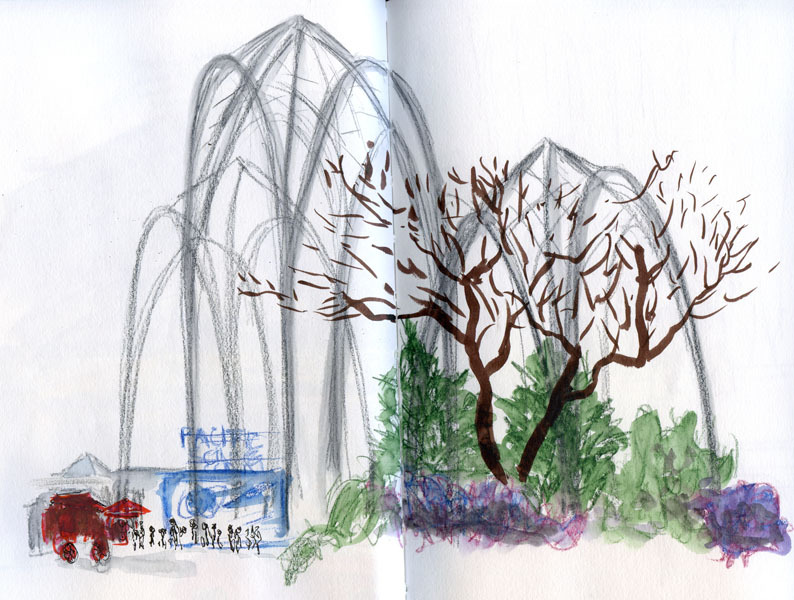 The Pacific Science Center’s iconic arches have long been something I’ve wanted to sketch, but didn’t dare. 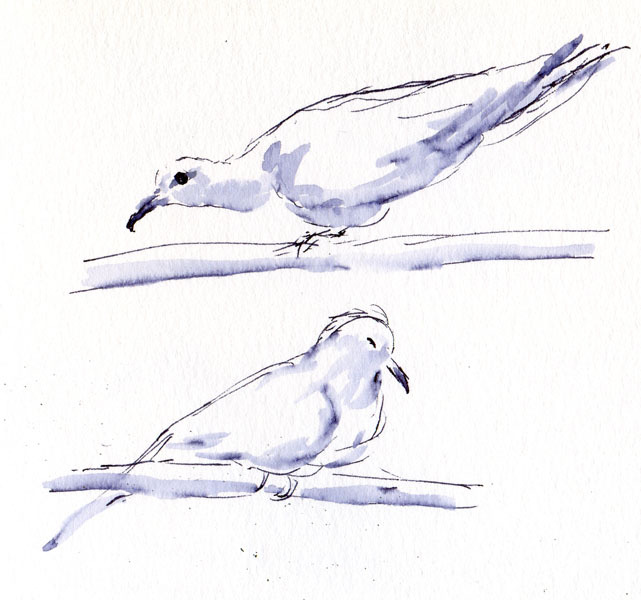 I knew that if I attempted their beautifully symmetrical webbing and intriguing shape with a precise pen point, I would get the perspective, angles and curves all wrong, if I had the courage to begin at all. 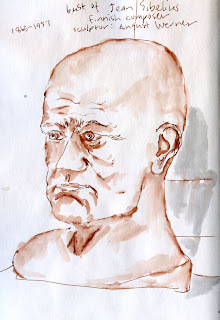 So I took a cue from Liz Steel, whose blog I study regularly, who has been experimenting with water-soluble colored pencils to make loose, expressive drawings. 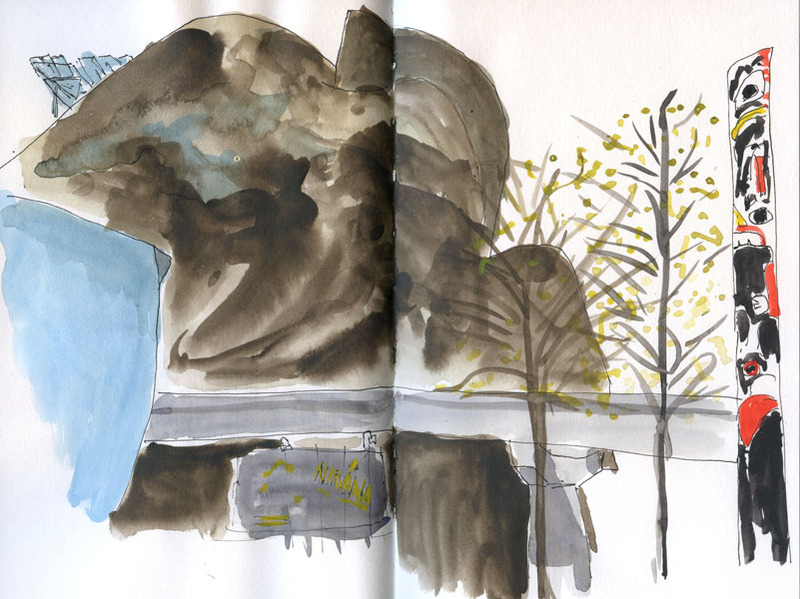 Paradoxically, I used brushmarkers – my usual medium of choice when I need a loose line – to sketch the finer-stroked tree in front of the arches. On my way back out to the bus stop, I decided to confront one more Seattle Center icon I’ve avoided previously. 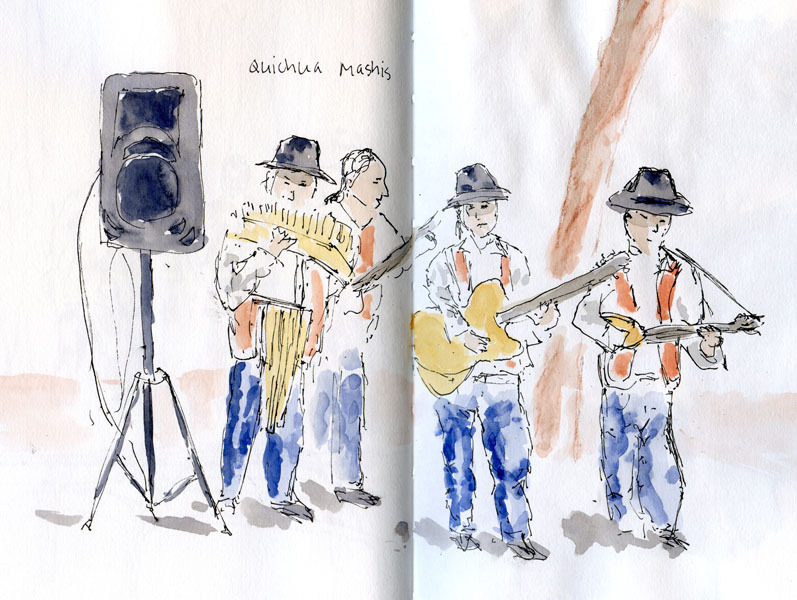 When the Urban Sketchers met last June to sketch a Habitat for Humanity demo site under construction, a number of sketchers took on the shining, amorphous blob that is the Experience Music Project. I chickened out, saving it for a braver day. 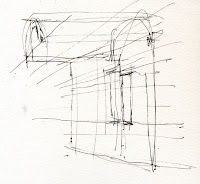 Apparently that day was today, although I took a baby step by sketching its back end, along with the monorail track. 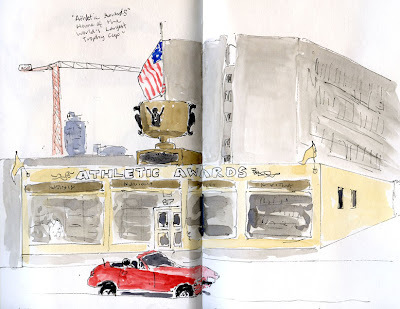 Athletic Awards is listed in Roadside America's “online guide to offbeat tourist attractions” for having the “world’s largest trophy cup” (which is also touted on the base of said trophy cup). Although I saw the photo of the trophy before I went, I thought it would be. . . shinier, bigger, somehow more than it looked to me. The image on the trophy cup of a stick man cheering didn’t quite convey the enthusiasm I expected, nor that the trophy seemed to be made of wood. So call me jaded. Driving anywhere with the top down, sketching anything in the warm, mid-afternoon sun: That’s good enough for me. I think of him as “the Green Lake organ grinder,” but his name is Gary Harding, and his business card says “Musica Molida.” Although the organ he cranks beside the path outside the Aqua Theater is from England, the beautiful cabinetry and cart that he uses to transport the organ were handmade by Gary. All the money that people put into the basket goes to help children in Zimbabwe. I didn’t recognize the tunes he was playing, and it turned out he had composed the music himself. In addition to grinding, Gary accompanies the organ with a small drum, cymbals and other percussion instruments. Shouldn’t an organ grinder have a monkey? Oh, there it is – a tiny one next to the basket. Sketching in the sunshine on the warmest day all month, listening to the music from the organ, I couldn’t think of many things that could make me feel more like spring was finally on its way. 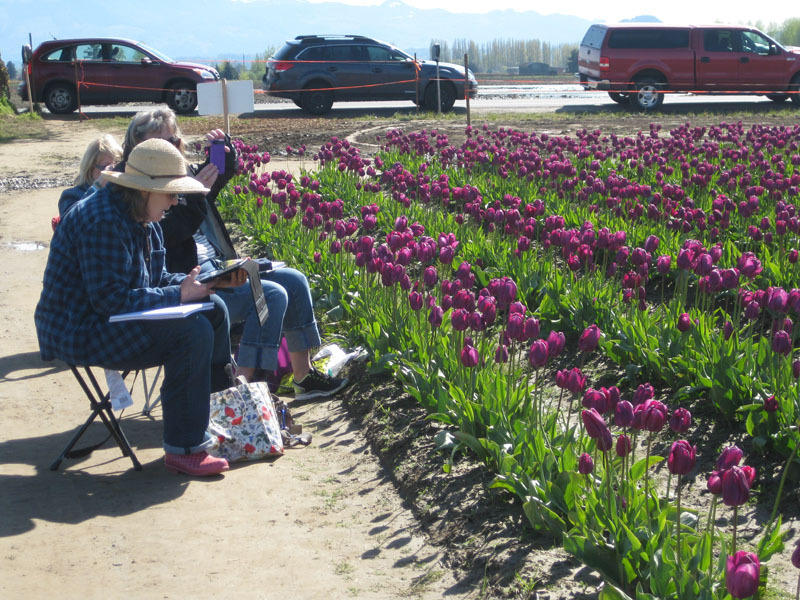 With an urge to see a few tulips, I joined the Anacortes Sketchers and Whidbey Island Sketchers in the Skagit Valley tulip fields for a day of color and sunshine. All that sunshine was deceptive, though – we could have used a bit more warmth! 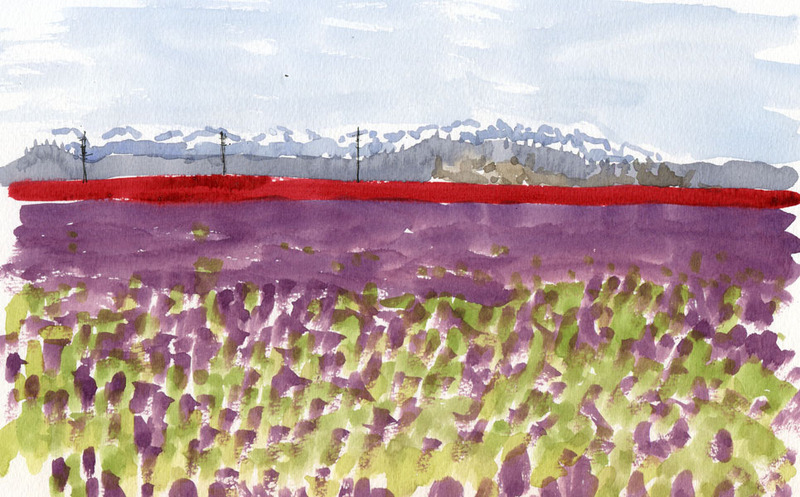 When I saw the endless fields of red and purple, my first reaction was to be overwhelmed. Where do I start? How? I decided it was a good opportunity to paint the way I have always wanted to paint but haven’t done much of – straight to color, no messing around with drawn lines first. When I switched views for a close-up of a few tulips, I considered drawing an outline first as I usually would. 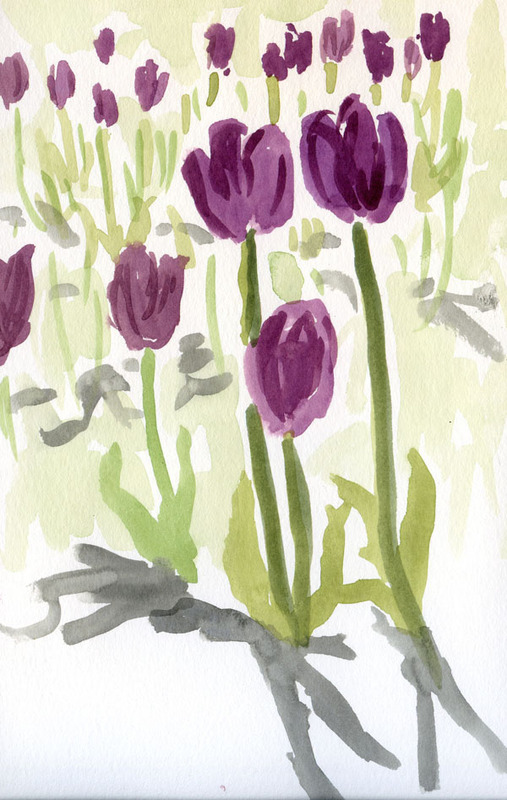 But I had enjoyed the looseness of painting the fields straight with paint so much that I decided to sketch the individual tulips ﻿﻿that way, too. 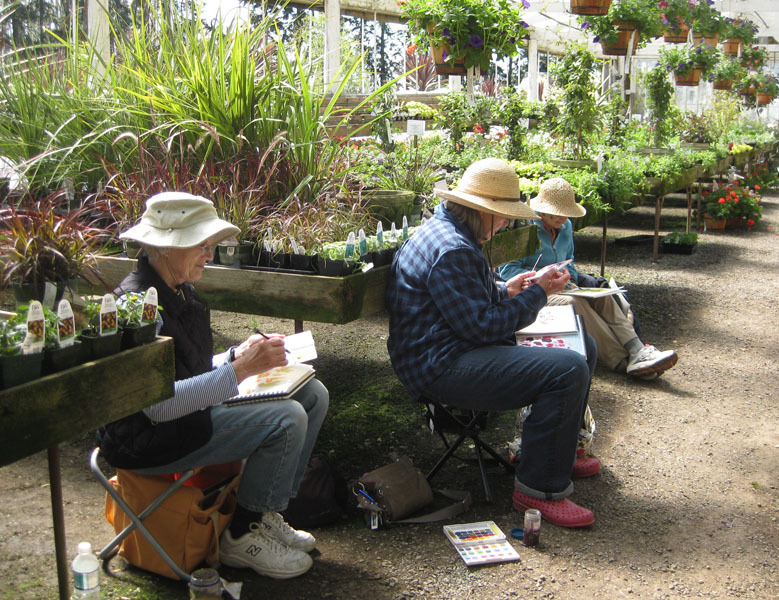 After stopping for lunch at a food truck parked outside Christenson’s Nursery and Greenhouse in LaConner, we were all still chilly from the morning in the fields, so we set up our stools inside the greenhouses. Although the flowers there were beautiful, it was hard to sketch potted plants after seeing the tulip fields, so I wandered until I spotted a couple of large cages filled with doves. 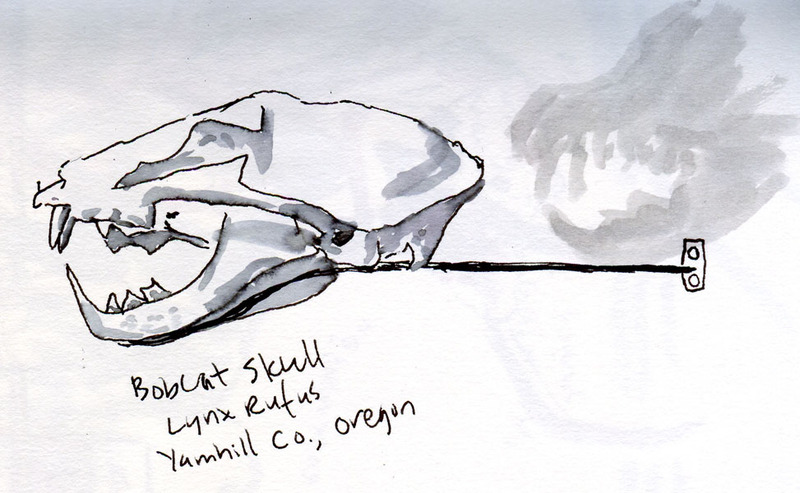 My thanks to Missy, Lisbeth, Carolyn and the other Anacortes and Whidbey sketchers for their warm welcome today! And I happily discovered that most of us will be meeting again very soon – at Gail Wong and Frank Ching’s Line to Color workshop in Mt. Vernon this Saturday! In general, I’m not prone to impulse buying. Whether the product is a pencil or a refrigerator, I do thorough research to increase my chances of buying a high-quality product that meets my needs. 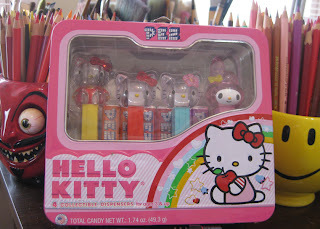 At the checkout stand, where specific products – candy, gum, tabloid publications, cigarette lighters, floss (what kind of person feels an impulsive urge to buy floss, I always wonder) – are strategically selected and placed to attract my eye while I have to wait, I rarely transfer a product from the display to my shopping cart. Rarely. I’m not sure what happened yesterday at the Uwajimaya checkout stand. 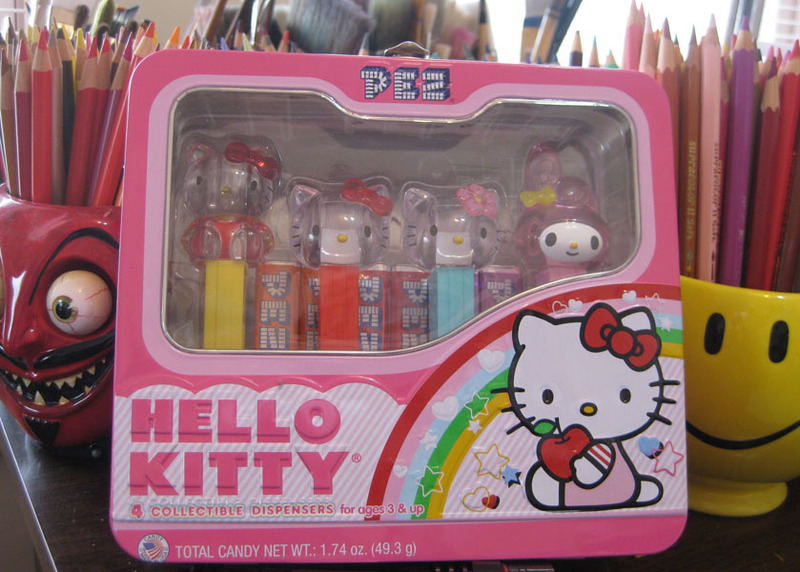 Maybe it was the precise combination of my weaknesses for bright colors, things that contain things (especially when the container has a transparent window) and nostalgia, but I found my hand transferring this product to my shopping cart: a metal lunch box with a transparent window containing a Hello Kitty Pez dispenser set (“Collectible Dispensers! For Ages 3 and Up”). I have no need for a metal lunch box (transparent window notwithstanding), I don’t collect Pez dispensers, and I don’t eat Pez. 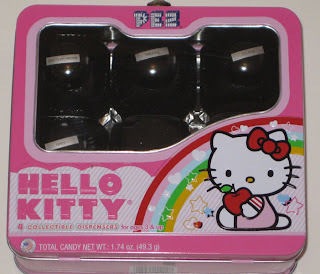 (OK, I used to collect Hello Kitty, but that was a looooong time ago.) So why did I make this very impulsive purchase? Because I had a hunch that the lunch box’s dimensions were exactly right for storing my ink collection! Note that there’s just enough space for one more bottle, which is going to be the bottle of Pilot Iroshizuku Take-Sumi that I just ordered. Every now and then, things in my life come together perfectly. 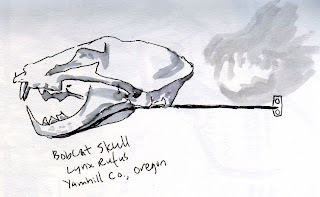 I was just finishing up the sketch of a bobcat skull mounted in a display case when I heard the tiny voice next to me asking the question. 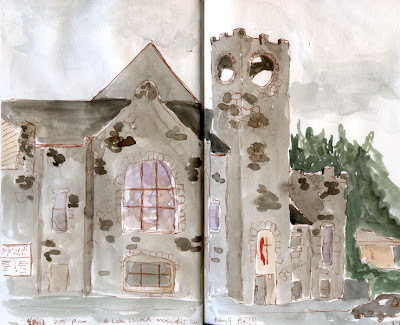 She couldn’t have been more than seven years old, and her hood was still dripping rainwater. 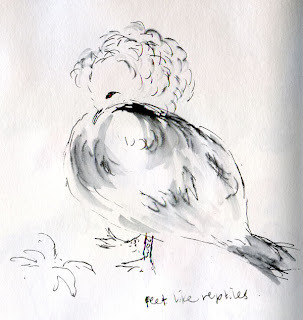 I showed her my sketch (below), and her already-large eyes opened even wider. She very articulately told me that she wanted to become a scientist someday. “Do you like to draw?” I asked. She nodded enthusiastically, so I suggested that the next time she comes, she could bring paper and a pencil and draw what she sees to get a head start on becoming a scientist. From her expression, I’d say the girl was having a light bulb moment. Around the corner in the mastodon exhibit, I was again amused, as I often am in museums, by how little time people spend looking at the exhibits. 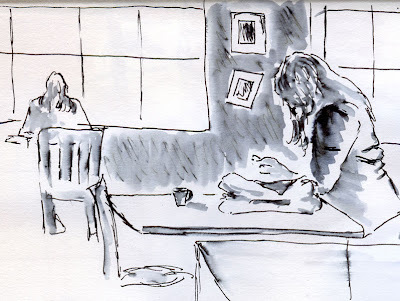 Maybe I used to be that way before I began sketching, but I hope I took more than the five seconds or so that most visitors seem to take. On any given day, I bet the Burke Museum is full of both light bulb moments as well as missed opportunities like these. Technical notes: At the same time that I got a sample of Pilot Iroshizuku Take-Sumi ink – my new favorite black ink – I also got a sample of Pilot Iroshizuku Tsukushi, which I thought might be a nice brown alternative to my favorite Diamine Chocolate Brown. Straight from the pen, it’s a warm medium brown, but when it’s washed, the shading turns mauve, or actually almost pink – too pink for me. Aside from the fun of being able to try lots of different ink colors, this is the best part about shopping for samples at GouletPens.com – I can try out an ink and its shading properties before committing to a whole (in this case, $28!) bottle of the ink. The mastodon sketch was done with my new Sailor calligraphy fountain pen. I’m still not adept at regulating the nib angle to control the line width, but it’s a fun pen to use and experiment with. In areas that will be shaded darker, I apply thicker lines of ink, which makes it easier to get a darker value. In theory, anyway. If I had greater control, I could probably vary the line width to a degree that shading wouldn't be necessary to imply the value differences. More practice, more practice. 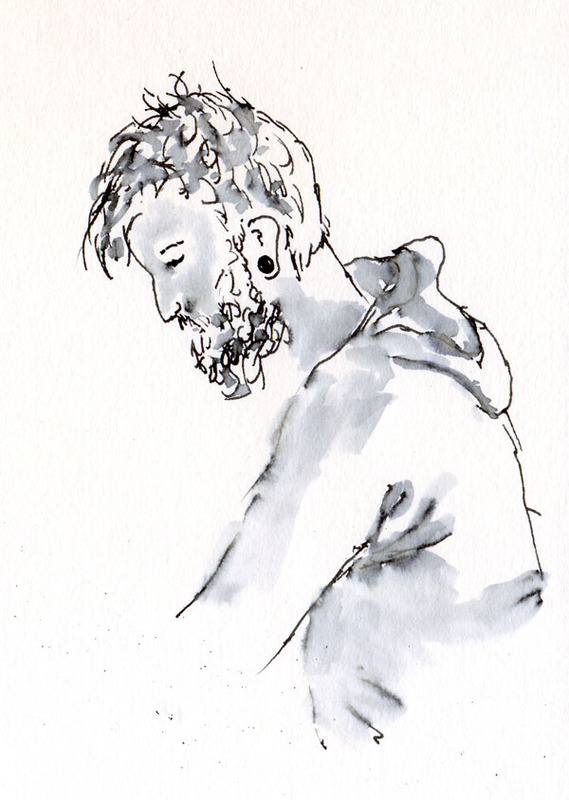 . .
With work to do this morning, I didn’t make it to Gage for a life drawing session on this rainy day as I’d hoped. 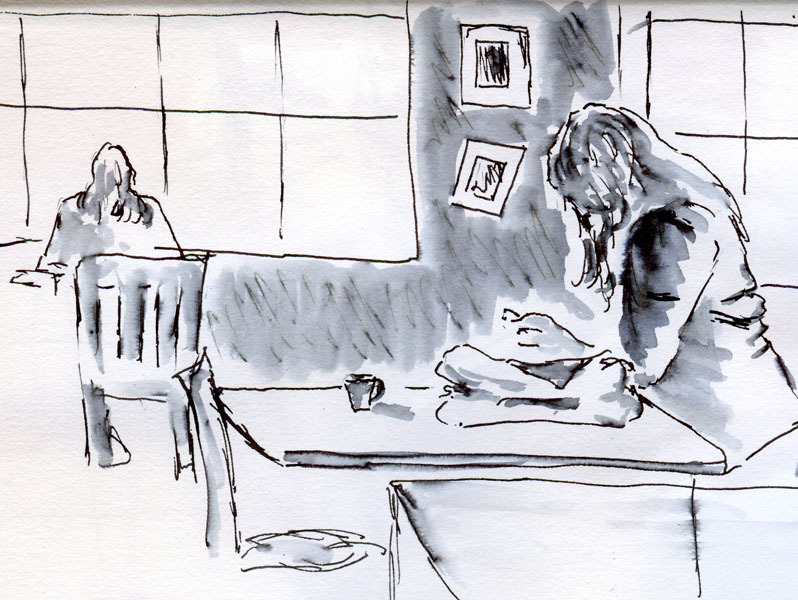 Instead, I finished up by noon and went over to Zoka Coffee for a real-life drawing session. As useful as drawing from a model is for learning human proportions and gestures, the range of shapes, sizes and demographics is delightfully wider at Zoka. I especially had fun sketching the little girl who was still wearing her gi from the karate class she had just come from. 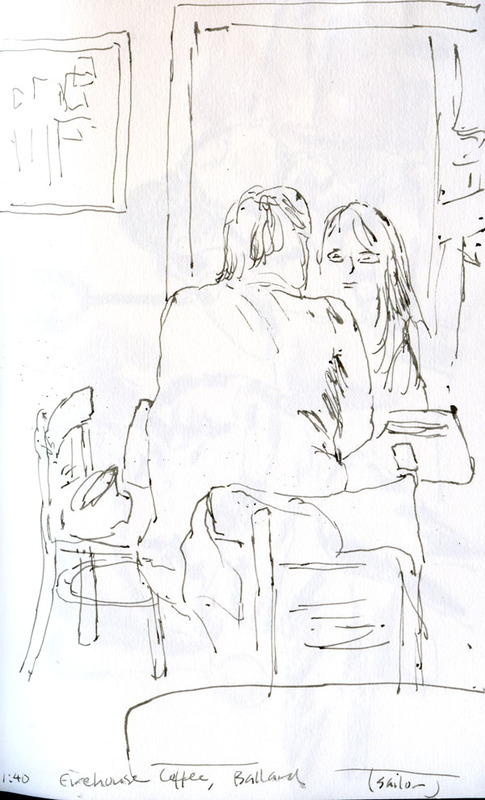 They left before I could sketch her mom, whose nose had the same shape. 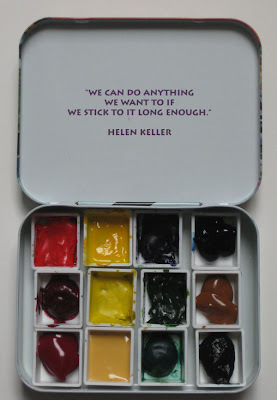 When I first started thinking about making a portable watercolor kit, I saw plenty of clever ideas on the Internet, many of which centered on mint tins filled with half pans. My primary design motivation was devising a way for the tin to attach directly to my sketchbook so that I could sketch standing up. I finally came up with the idea of using a tiny, square Trader Joe’s mint tin that could hold up to 16 colors in the form of stubs of Daniel Smith watercolor sticks – the maximum number of colors in the smallest, lightest space. I’ve been using that tin happily for nearly a year. 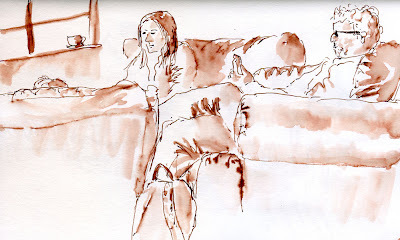 While taking a watercolor class in January, I wanted to try using Winsor Newton tube paints (recommended by the instructor and preferred by many sketchers). 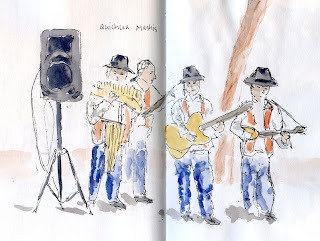 I started to appreciate their richness of hue, and I was learning about their mixing qualities. In class I used a full-size traditional palette that easily accommodated the 17 colors I had, but I didn’t want to use that palette in the field. I picked out eight colors and put them into half pans, which was all that would fit into a TJ’s mint tin. Unfortunately, I was very unhappy using only eight colors, and no matter which eight I selected, the one I wanted was the one I didn’t have with me. So that tin didn’t last long, and I happily went back to my 16 Daniel Smith sticks. 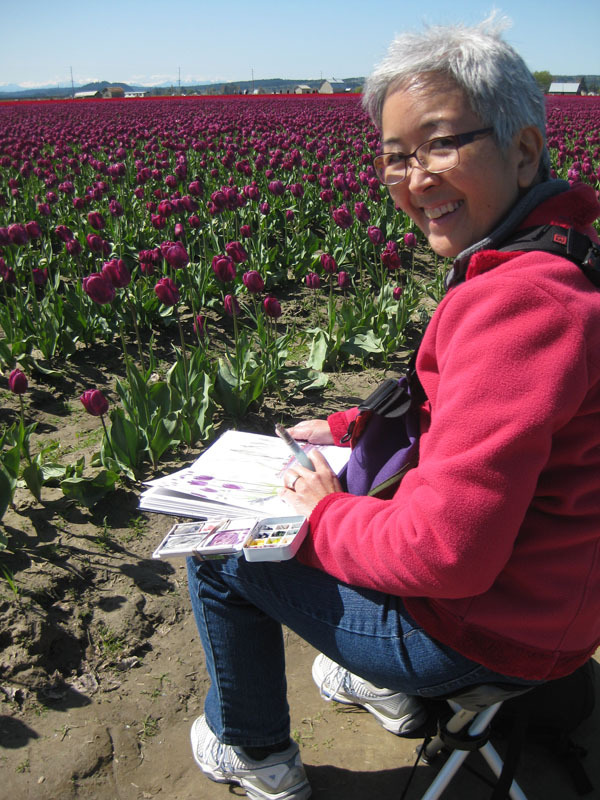 Now I’m getting ready for another watercolor workshop – this time with urban sketchers extraordinaire Gail Wong and Frank Ching as instructors. 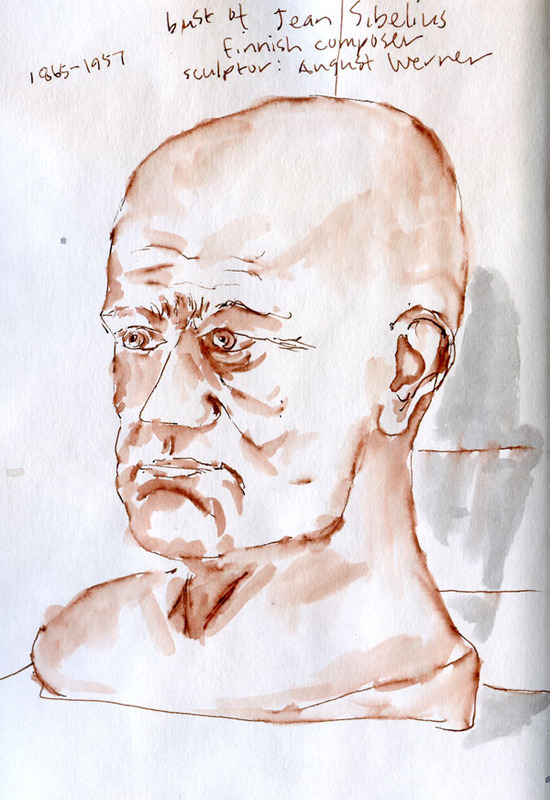 I’ve also been looking over the supply lists for the workshops I’m taking at the Urban Sketchers symposium in Barcelona, and a couple of those instructors recommend Winsor Newton tube paints. So now I want to again give tube paints a try. 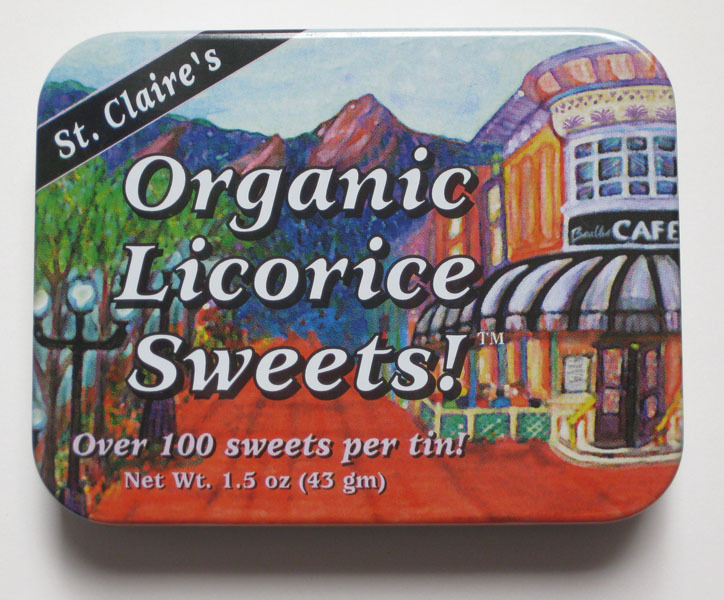 I dug through a junk drawer and found a St. Claire’s Organic Licorice Sweets tin, which is the same size as Altoids, Sucrets and other popular tins that sketchers are transforming into sketch kits, so I knew it would accommodate 12 half pans. (I miss the transparent window in the TJ’s tin, but the quotation by Helen Keller on the St. Claire’s lid makes up for it.) It wasn’t too hard to eliminate five colors from my collection of 17 tubes to get 12 into the tin. Below is the palette I selected. 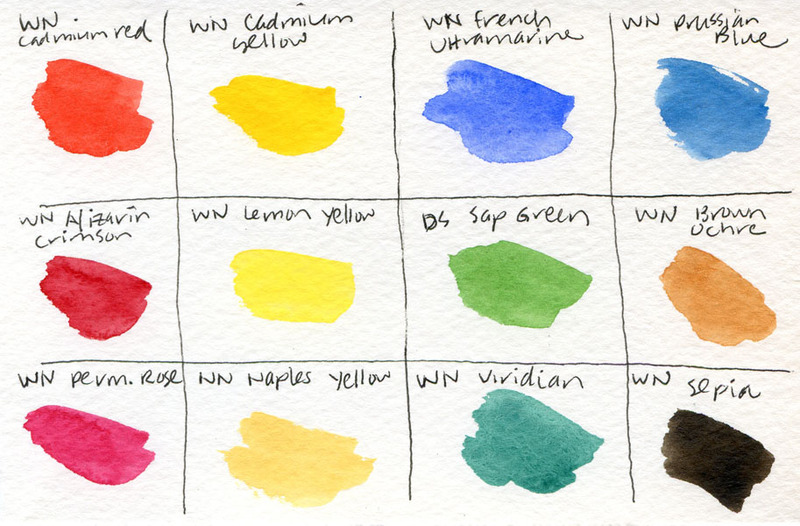 The 12 colors in my latest portable sketch kit. 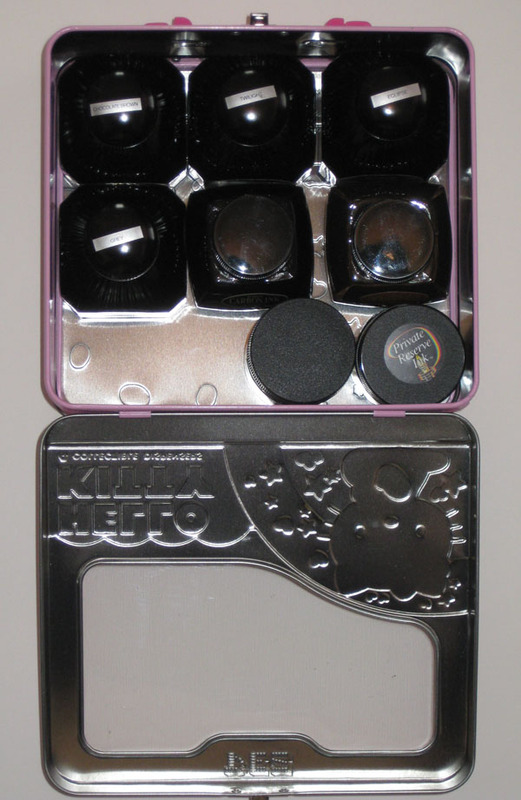 Despite all the sketch kits on the Internet that center on the classic Altoids tin, I’ve resisted using it because it would be larger and therefore heavier. 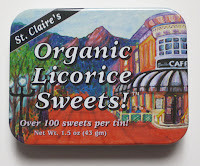 Indeed, the St. Claire’s tin filled with 12 half pans weighs 58 grams, while my faithful 16-color TJ’s tin weighs only 40 grams. That difference might not seem significant, but when it’s attached to one side of your sketchbook, it’s a matter of both weight and balance. But I’m motivated to give tube colors another try. If you look on the right side of my blog where tags are listed, you’ll see that I have one for memorials and monuments. 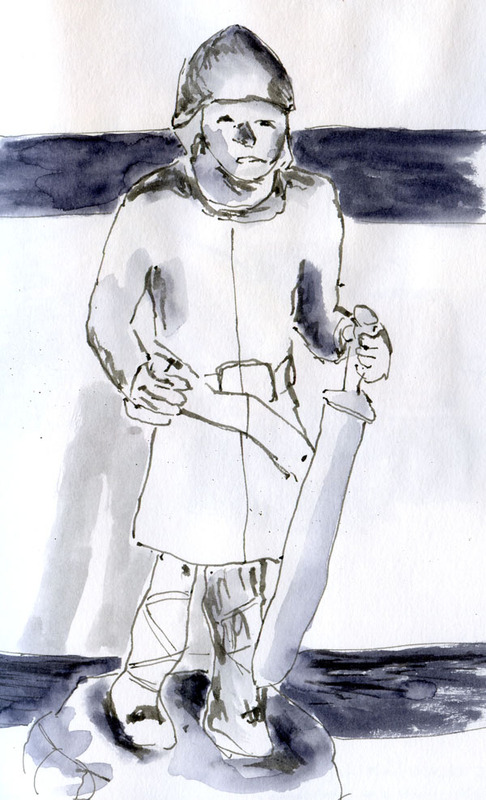 Last summer when I visited Boston, I sketched several statues and other memorials, and those prompted me to start a list of all the memorials and monuments in my own hometown that I’ve hardly paid attention to, let alone sketched, and decided I would make a point of sketching them eventually. Long on that list has been Vladimir Lenin, whose 16-foot bronze sculpture had been removed from its original installation in Czechoslovakia in 1989 after the revolution. Rescued from destruction by an Issaquah resident, the statue was installed in Seattle’s Fremont neighborhood (not without controversy). 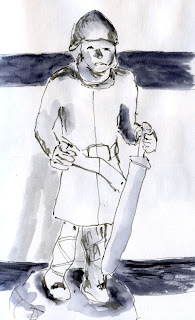 I mentioned my memorials and monuments tag because all the other statues I’ve sketched in that category have been erected to honor people or events. Given how often Lenin is “accessorized” in Fremont (in drag for the Pride Parade, with Christmas lights during the holidays, as John Lennon during the Solstice Parade, and the red paint on his hands), it’s hard to say whether the communist leader is being honored at the busy intersection of North 36th Street and Fremont Place. But in Fremont, anything can – and does – happen. In any case, still inspired by this week’s Urban Sketchers Flickr group theme, “Oddities in Your Town,” I knew it was time to cross this statue off my list. In addition to the one I used today, I spotted a number of other convenient benches and standing areas around this intersection that would make Lenin a good subject for multiple sketches from various angles. 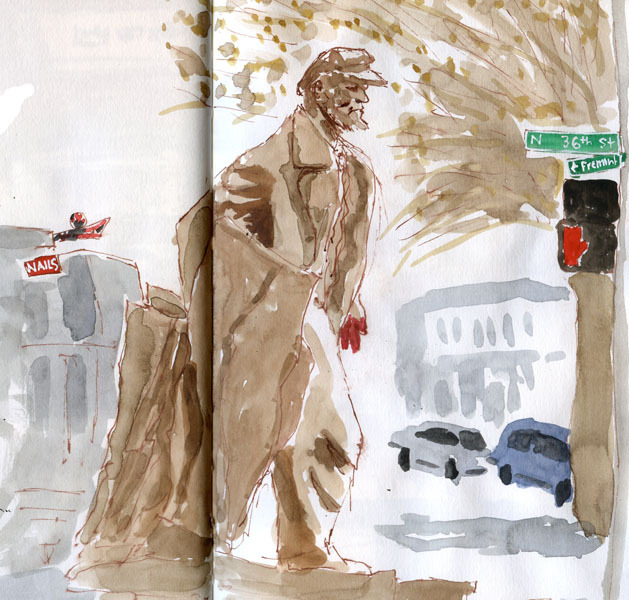 A Lenin-themed sketchcrawl, perhaps? 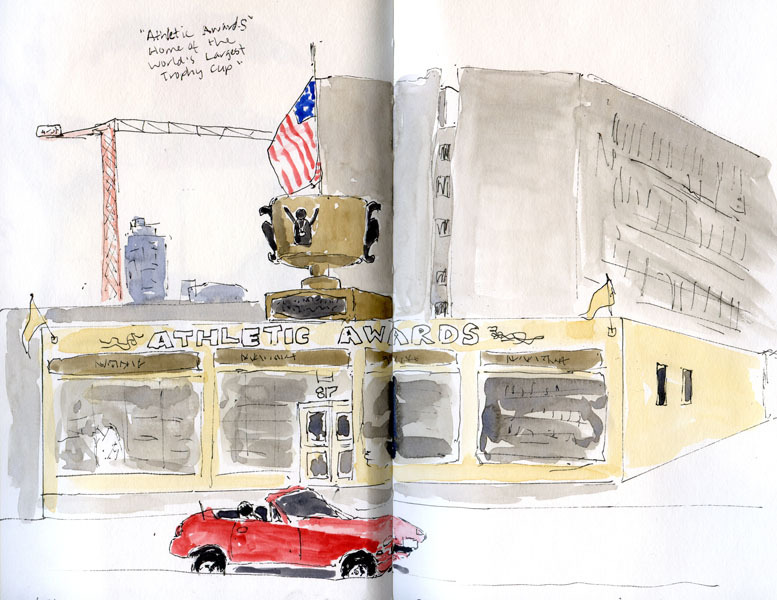 Growing up south of downtown Seattle, I rarely ventured as far north as North 88th and Aurora Avenue North (OK, so I led a sheltered childhood). On those occasions when I did, Aurora seemed full of exotic sights, not the least of which was this elephant. 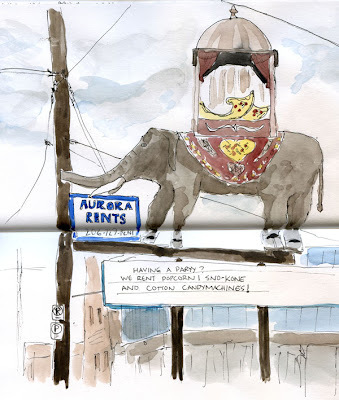 As a child, I thought the elephant – part of an eye-catching sign for Aurora Flower Shop – looked fairly realistic. Fast-forward a few decades, and the elephant doesn’t look quite as realistic to me now. But dating back to 1936 (on Aurora since 1946), it has a colorful past (which you can read about on RoadsideAmerica.com), including the urban legend that it was an actual taxidermied elephant killed on safari. The flower shop closed in 2004, and currently the retail location belongs to Aurora Rents. 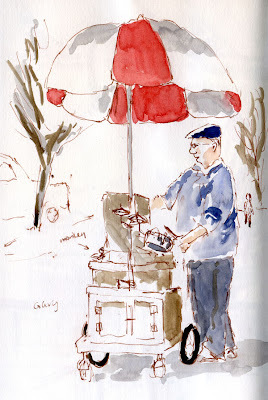 When I saw that the Urban Sketchers Flickr group’s theme this week is “Oddities in Your Town,” I came up with a number of candidates (many of which are listed on that same Roadside America site), and this is the first I’ve sketched. You’ll see more as the weather improves during the next few months. 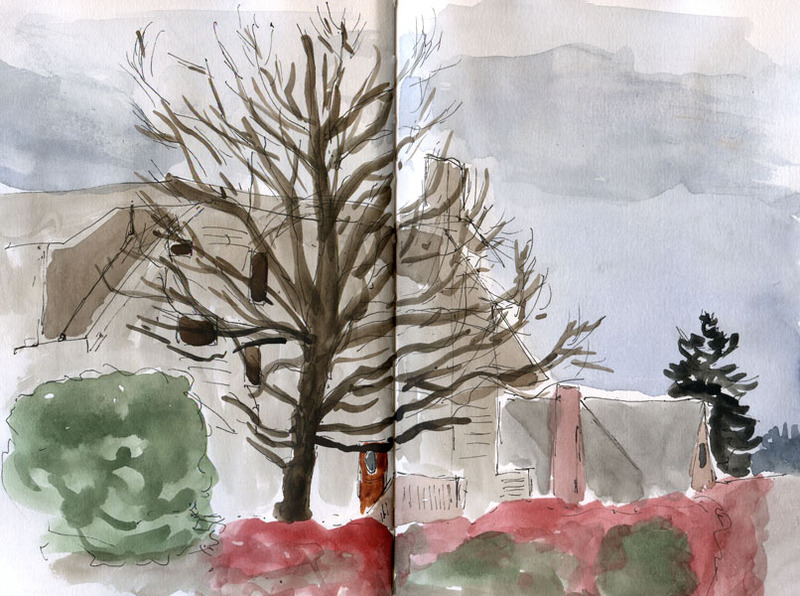 For the 39th World Wide SketchCrawl, the Seattle Urban Sketchers met at University Village on a bone-chilling morning. 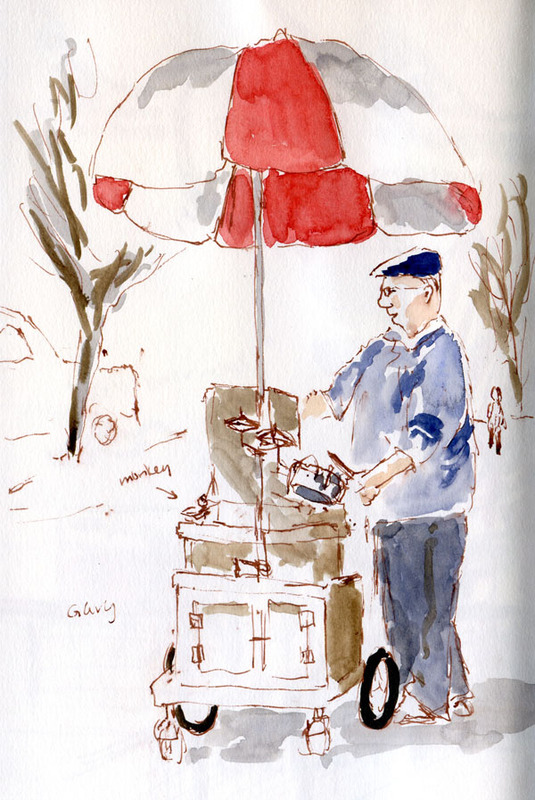 I saw several hardy sketchers braving temps in the low 40s, shivering in their hats, gloves and parkas to sketch U Village’s sheltered but unheated shopping corridor. Not me. Kate and I headed straight for Room & Board, the store that moved into the space vacated by the (sorely missed) Barnes & Noble last year. 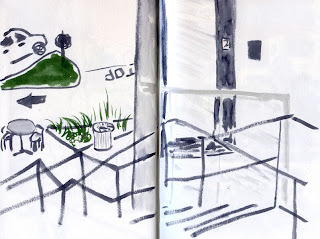 Just outside the store proper was a hospitable set of outdoor furniture in a heated and sheltered area – an ideal place to sit and sketch comfortably. First I did a quick abstract value study standing above the stairway leading up to Room & Board (at right). 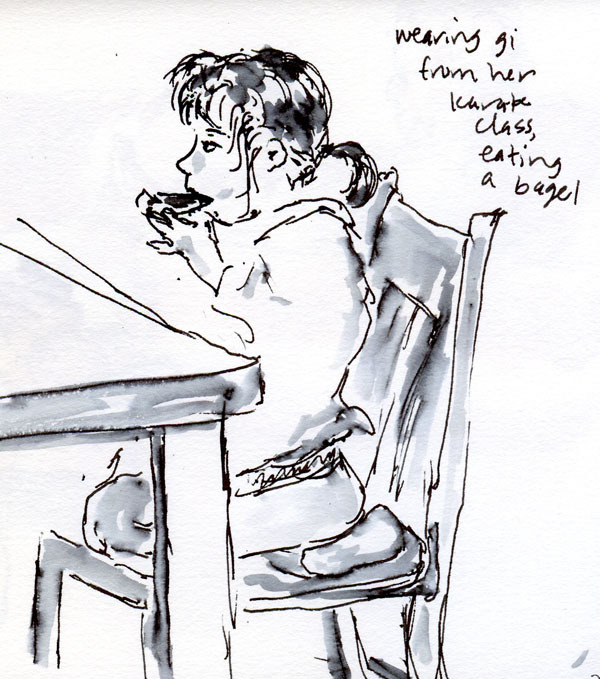 While I sketched this, Kate sketched me sketching this. Then I settled in for a good hour-plus (longer than I usually spend on a sketch) to sketch the parking lot facing Crate & Barrel (top). I think I filled my quota of car sketches for the rest of the month. Ever since I declared my moratorium on the Noodler’s Ahab fountain pen (which made it onto my Bottom 10 list of most annoying products) and its infamously high-maintenance flexible nib, I’ve been searching for other fountain pens that will render a similar thick-and-thin line. Some brands that have come up often are either hard to find (the Chinese-made Hero) or expensive (Namiki Falcon). 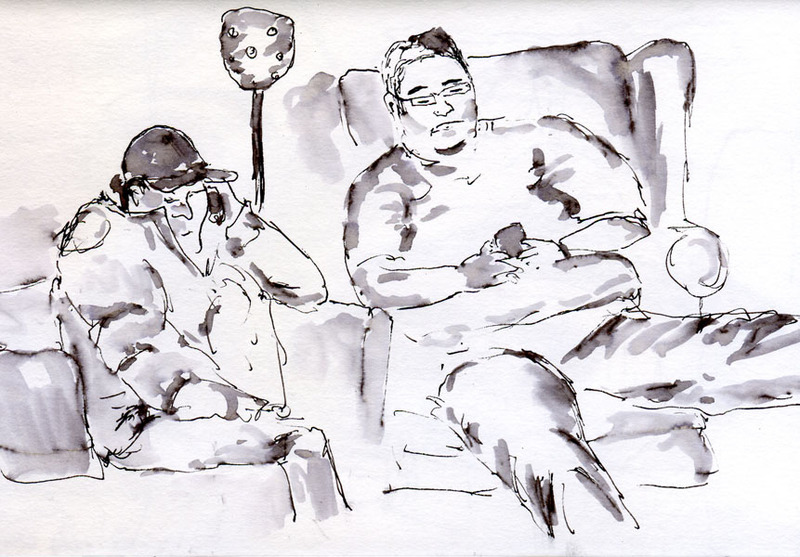 Before I left the Firehouse, I pulled out a trusty Lamy to sketch two more patrons in the comfy chairs (top). 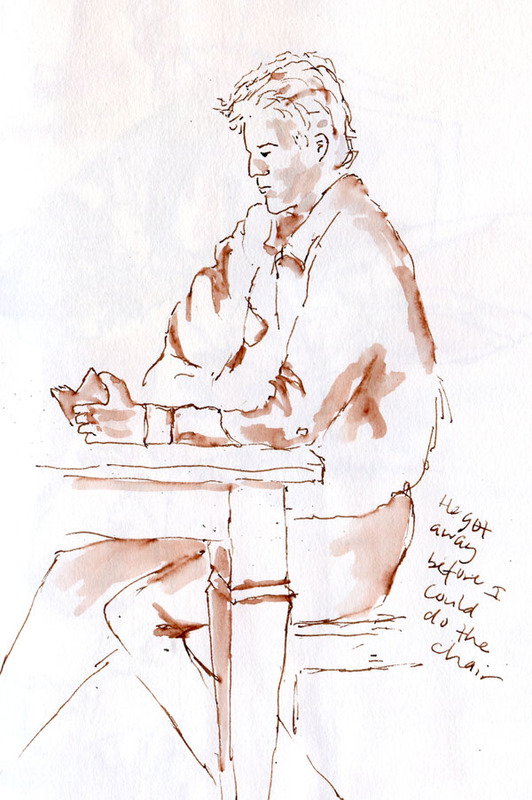 The woman talking on her phone kept looking up at me, and I was afraid she suspected what I was doing, so I sketched furtively in record time. I’ve gotten so used to sketching people in coffee shops, though, that I’m generally undaunted: It takes a lot of intimidation to make me give up a sketch. 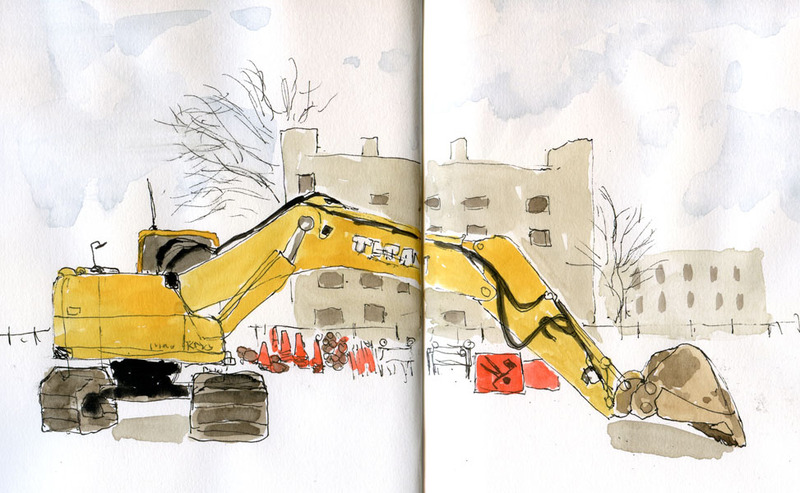 In fact, it just makes me a faster sketcher. 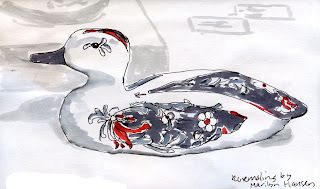 teaches the decorative painting folk art at the museum. The duck was in a glass case filled with many more examples of Hansen’s work. 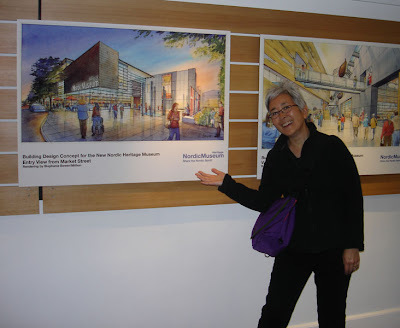 As we were getting ready to share our sketches, Carleen and I noticed some architectural renderings on the wall for the new Nordic Heritage Museum building to be built close to Salmon Bay. The name on the architectural drawings? Seattle Urban Sketcher and architect Stephanie Bower! Where’s the Ibuprofen for Life Drawing “Muscles”? 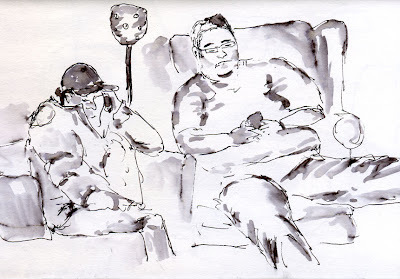 Life drawing is like working out at the gym: The longer you’ve been away, the harder it is to get back to where you were when you left – and the more it hurts. It had been about a month since the last time I went to a life drawing session at Gage, so I knew I was getting flabby. It took me all of this morning’s two-, five- and 10-minute poses to stretch and warm up, and I was still feeling creaky when we had worked up to 20-minute poses. When I’m out of practice, it even takes me longer to see what the problem is. I was completely finished with the 20-minute sketch of the reclining pose (below, right) before I realized it was out of proportion. 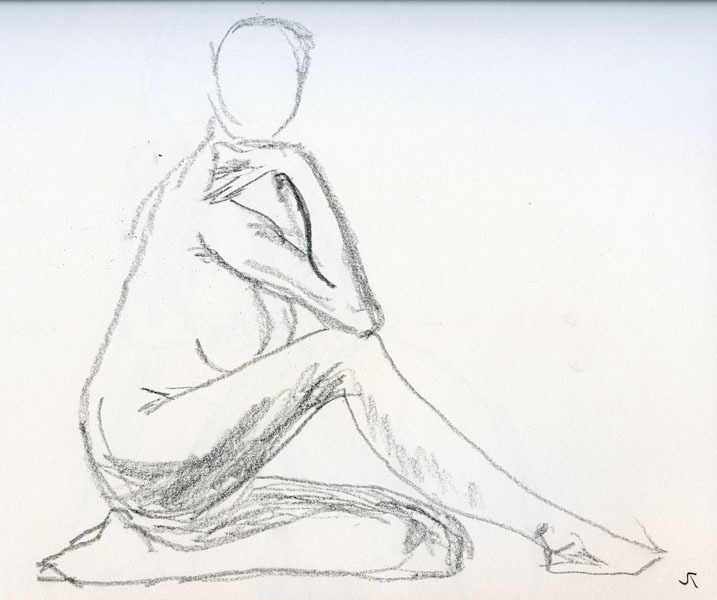 And as I’ve talked about before, with figure drawing, proportion is everything. Once the weather gets warm and dry ﻿﻿enough for location sketching, I’m not planning to spend much time in Gage’s life drawing studio. I’m already achy, though, anticipating how I’m going to feel in the fall after staying away from the “gym” all summer. Ouch. Ever since last December when I went to hear a holiday concert there by the City Cantabile Choir, I’ve been meaning to go back to Green Lake United Methodist Church on a rainless day to sketch it. More than a hundred years old, it’s an amazing stone building that resembles a castle. Even the top of the tower has what looks like a battlement. Although it had been pouring all morning, the sun came out for my noon walk around Green Lake. By the time I finished lunch, it looked like it was going to stay out for a while, so I headed out for the church. By the time I got there 10 minutes later, it was starting to sprinkle. I spotted a convenient overhang around the school directly across the street from the church, so I ducked under it. It took me a little more than an hour to finish the sketch, and during that short time, I saw a downpour of rain, hail, a little sunshine and more rain. 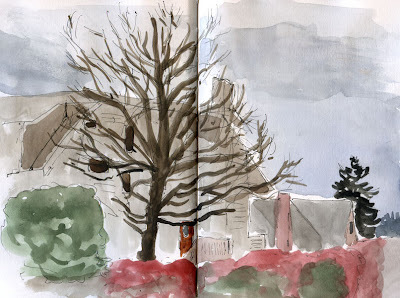 But thanks to that overhang, my sketch and I stayed dry. The year 2021 seems like a long way away, but the heavy equipment and other construction paraphernalia have been moving into the area for a while now. I don’t know when work is scheduled to begin, but I figure any day now the area around Northeast 66th Street and 12th Avenue Northeast might be closed off, and my opportunities for a good sketching view might be limited, so today seemed like a good day to sketch one of the Titan earth movers. I counted six of them on the property today, patiently waiting to come alive with noise and activity. An obligation that had filled my whole calendar today got cancelled – a delightful gift of time – so I decided it was a good day to take on a couple of sketching nemeses. 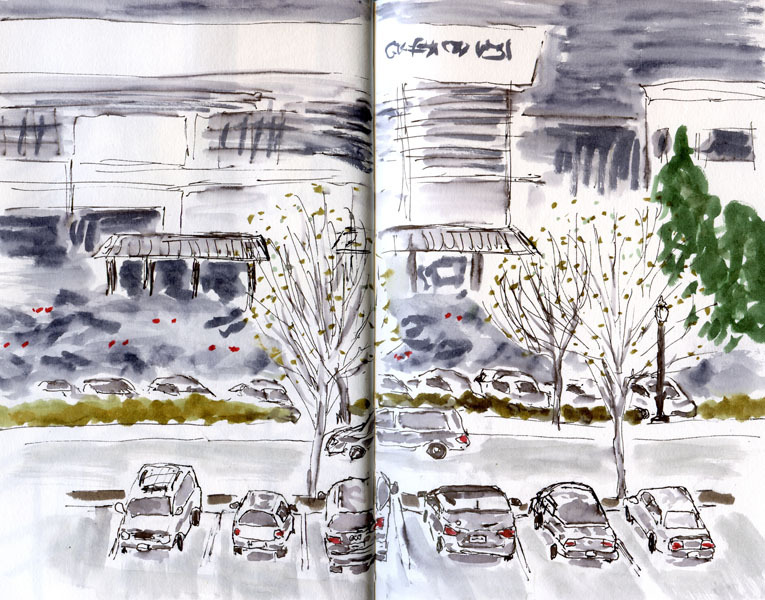 As happened on at least one previous occasion, I got frustrated looking for something to sketch inside Northgate Mall and ended up out in the parking lot. I drive a very small car that rides so low to the ground that I’m usually eye level to most vehicles’ license plates. About to turn on the ignition, I found myself face to face with a truck that I probably could have driven underneath – a nemesis if I’ve ever seen one. 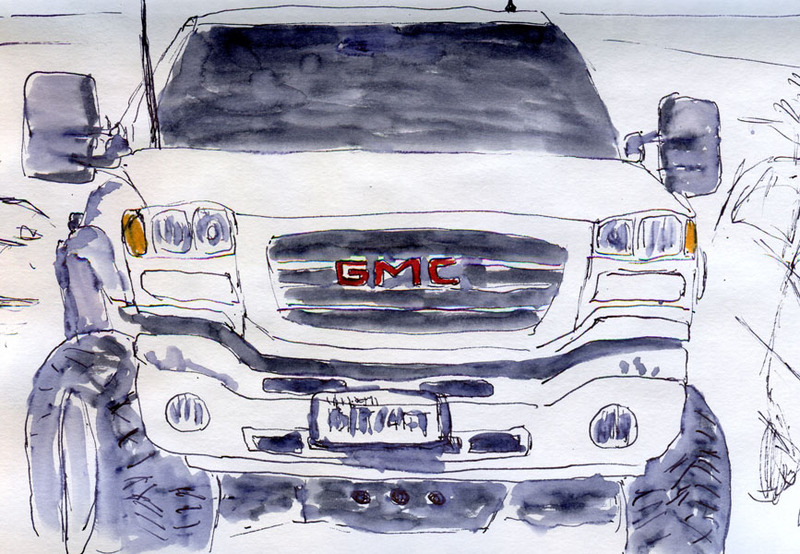 The young couple who belonged to it came back and drove away before I was done, but I’ve learned from previous car-sketching experiences to mark things like shadows and reflections right away so that I can still finish the sketch. With that notch on my belt, I went looking for the next one. Driving home on Fifth Avenue Northeast, I decided to turn west on Northeast Elk Place, a block-long street that is more like an alley. The thick clouds looked like they could crack open with rain at any moment, so I stayed in the car. Despite all the trees that have already fully blossomed and lost their petals, plenty of totally bare trees still stand everywhere, including this one. Like me, they’re still waiting for the real spring (last weekend’s flirtation turned out to be just that). The sky changed colors at least five times while I sat there, and as I finished up, it started to pour. As a native and lifelong resident of Seattle, I sometimes take for granted how close we are to mountains and water (both fresh and sea). My spouse-man, who grew up in the Midwest, does not: He points out the beauty of the snowy Olympics every time we drive home toward Maple Leaf after grocery shopping in Wedgwood, or he compliments the Cascades as we approach Lake Washington from the International District. After filling my gas tank on Fifth Northeast a few blocks from home, I turned west onto Northeast 85th, a street that ends at the barrier wall between the neighborhood and I-5. Beyond the wall is a glimpse of Phinney Ridge and the deep blue Olympics still topped with snow. A humongous fir tree happened to dwarf the view, but it, too, is part of the scene that makes Seattle home. Sketching it once in a while keeps me from taking it all for granted. 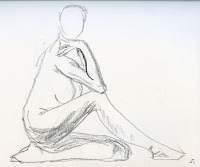 Anyone who has ever done life drawing with a model knows that there’s nothing easy about drawing naked skin. But I have to say, drawing clothed skin is no cakewalk, either. 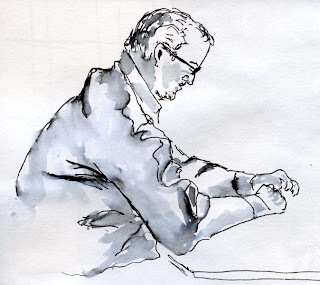 One of my life drawing role models is Don Colley, a master at capturing the human form, clothed and unclothed. When you see his drawings of clothed people, you can tell exactly which way the body is moving, where the weight is or how tight the clothes are by looking at the creases and folds in the fabric. And by the way, he works his magic not with smudgy graphite or charcoal, but with markers! Sigh – more practice, more practice.